Today, the Club Penguin Times Newspaper Issue #344 has been written and which is now up on Club Penguin. This weeks newspaper mostly includes news about Scorn and how we penguins defeated him once and for all. 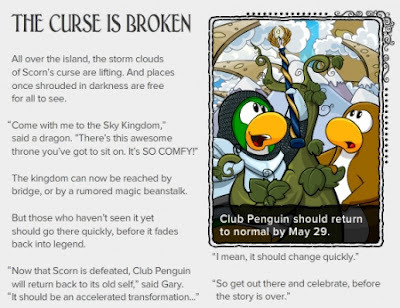 The second article, "The Curse is Broken" mainly talks about how Club Penguin is free and safe once again and how Scorn's curse is broken and how the clouds are quickly lifting. Also, remember to go check out the Sky Kingdom before Club Penguin raps up the party on May 29, 2012. The last article are the Upcoming Events. 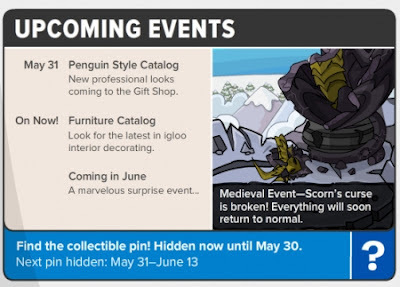 Here we have 2 events quickly approaching Club Penguin they're the Penguin Style Catalog and coming in June the Super Hero Party 2012 for the first time ever. What do you think of this weeks newspaper issue? 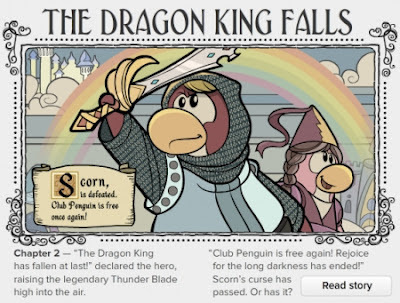 I'm glad how we penguins defeated scorn and there's a possibly of no more of him. Anywho, what do you think of this weeks newspaper issue? Leave a comment below we'd love to hear all your responces and comments!